On my first two visits to India in the early to mid-2000s, I had idly or dosa for breakfast almost whenever possible. I’m a huge fan of South Indian breakfasts. Unlike most North American and European breakfasts, which tend to be on the sweeter side (think: cereal, toast with jam or even chocolate spread, pastries, muffins, pancakes), Indian breakfasts are typically spicy and savory… and did I mention: delicious? Amazingly, it wasn’t until my third and fourth trip to India that I got to know the Indian breakfast hit, poha. These kinds of things happen if you’re too focused on your favorite dishes and foods! That’s why it’s so important to try new things. Be open to suggestions, take chances, and enjoy invitations to home cooked meals! I encountered poha so late in the game probably because it’s much more of a family dish – prepared at home kitchens across India. It’s less likely found on restaurant menus. That said, some hotels (code word for restaurant on the sub-continent) and breakfast spots do offer poha. 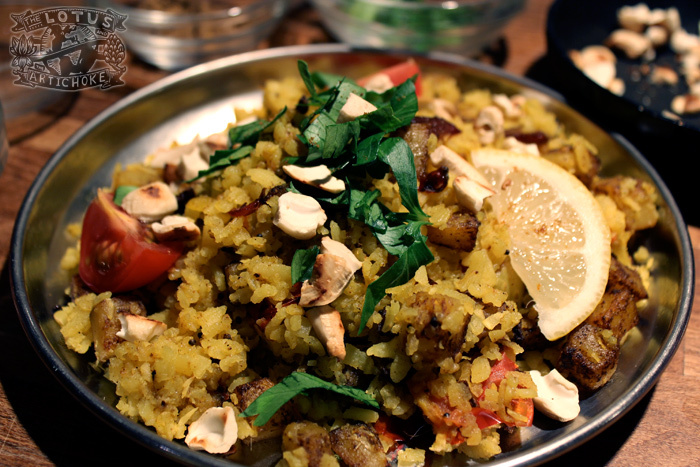 The best poha I ever had, as with many Indian dishes, was not at a restaurant, but at a home. A very special home in fact, where I was welcomed and treated like family. If you’ve been following my stories on this blog, you know I lived for a year in Amravati, India – deep in the state of Maharashtra. I had amazingly generous and attentive neighbors, and my host family was particularly endearing and kind. I believe it was on the second day after arriving that I was served poha for breakfast. It was fantastic, and I’ve been hooked ever since. Every Sunday morning (and many evenings during the week) the family living in the house next door would call out to me with offers of hot food. “Justin Sir… you want breakfast?” Sometimes it would be idly, sometimes toast and dal, sometimes dhokla, and very often a steaming, colorful plate of poha. Chances are, if you haven’t spent much time in India and don’t have the privilege of Indian friends and family who invite you for insanely delicious meals, you might be wondering what in the world poha is. Simply put, poha (also known as pauwa and pohe, among many other things in the many languages of India) is flattened rice flakes. Some packages call it “beaten rice”. Beaten or flattened, you decide. I like to think of cooked poha dishes as a sort of breakfast biryani, made with rice flakes instead of rice. Soak those flakes in water briefly and fry them up with some spices and potatoes and you’ll become a rice-flake devotee, too. This recipe is based on many experiences and experiments in the kitchen while living in India. Every cook makes poha in their own special way. Mine has evolved under the influence and instruction of many neighbors and friends who offered terrific advice and tasty examples. Once I got good enough, I’d make this in the morning and bring enough with me to work in my tiffins to share with the other teachers at lunch. My first attempts were amusing, and I got lots of interesting feedback – mostly about missing, incorrect, or under-used spices. After a few tries, mine was so authentic that my co-workers even accused me of having brought poha made by the neighbors! Win! Be sure to check out the variations below for more ideas. The base recipe is fairly straight-forward. When I make poha at home I love to add fresh ginger, more spices, and grated coconut. What’s your style? Soak poha flakes in bowl with water for 5 min. Drain excess water, set poha aside. Heat oil in large frying pan or pot on medium high. Add mustard seeds. After they start to pop (about 20 sec), add onion, cumin, paprika, turmeric, other desired spices*. Fry until onions are browned, about 2-3 min. Add potatoes. Cook 5 min, turning often. Reduce heat to medium. Add tomato. Mix well, fry until potatoes are crispy outside, soft inside, about 5 min. Add poha, lemon juice, sugar, salt. Mix well, cook 2-3 min, stirring constantly but carefully. Add small amount of water and cover briefly (to steam) if poha is too dry. Turn off heat, cover. Allow to sit a few minutes. Garnish with cashew pieces (raw or lightly roasted), lemon slices, and fresh coriander leaves and serve! Vedic style: replace onion with pinch asafoetida (hing) powder. More veg: add with potatoes: 1/2 cup peas, green beans, chopped carrots or green pepper. *Amp the spice factor: add some of these along with the other spices: 3-4 curry leaves, 1/2 tspn garam masala, 1/2 tspn ground coriander, 1 tspn minced fresh ginger, and 1/2 tspn red chili flakes or 1 diced hot chili. Fruit accent: Add 2 Tbs golden raisins or chopped dates along with tomato. 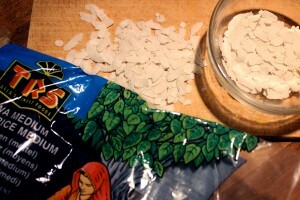 South Indian coconut love: Add 1-2 Tbs dried or fresh grated coconut with poha for last few min of cooking. Poha (rice flakes) are available at most Indian and some Asian grocery shops and supermarkets. This entry was posted in Indian, North Indian, South Indian and tagged breakfast, Indian, poha, potatoes, recipe, snack, vegan. Bookmark the permalink. This looks wonderful, and has me wishing I would have picked up some poha at my last trip to the international grocery store. Next time! Thanks Jessica! You should definitely try it. I know very few people outside of India that have made poha, or even tried it before! I’m trying to spread the word! I’m looking at your site now and will leave a comment or two, soon. Yum! Poha are my favourite quick meal and a great alternative to regular rice. Your version looks delicious! Does K.O. Rasoi mean “Knock Out Kitchen”? ‘Cause your photos and recipes are totally amazing! Thanks for the kind words on my poha. I had lots of local help and inspiration in India. But surely not as intense as the instruction you must’ve gotten growing up!